A customer success story: With Kings III's help, a leader in the storage industry upgraded their emergency telephone systems to cellular lines nationwide. See the process and the resulting benefits. As with most systems, emergency telephone needs can vary quite a bit by industry or property type. 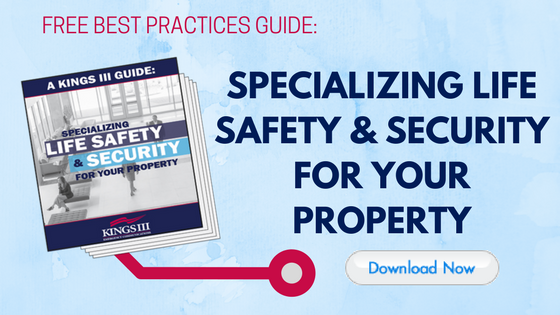 For example, storage facilities face a unique set of safety needs that are not even on the radar for many other types of properties. In addition to this, and as compared to other property types, a higher level of efficiency and organization is often expected --- as those that utilize the space entrust the facility to keep track of their valuables and those that manage the space want to do so in an orderly way that makes the most productive use of their space. We find that these factors are often what shapes emergency telephone system expectations for those who manage such properties. They need something that will provide ample and full protection that they can easily identify and account for without creating extra chaos and redundant costs and/or interfering with other systems. At our simplest, Kings III offers an emergency help phone solution that universally benefits all types of properties in both the commercial and residential space. While our offering remains the same, the way we customize, install and implement our solution is not a “one size fits all” type of thing. Rather, Kings III works with our customers to execute our services in a way that makes sense for them and their properties. Please see below for a description of our current endeavor that we are working on with Extra Space Storage involving the elimination of their POTS (Plain Old Telephone Service) lines, most commonly referred to as landlines. We have been working with Extra Space Storage for more than ten years. We were providing emergency elevator phone monitoring for a single storage facility location when they were acquired by Extra Space. 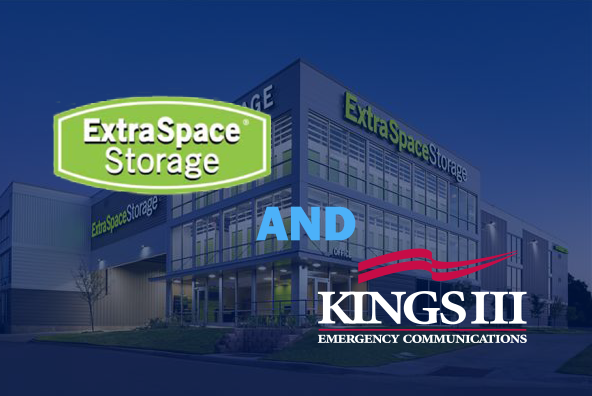 Management at Extra Space was impressed with the value the Kings III service brought to that location and we began talks to roll the service out across their portfolio, essentially standardizing a consistent emergency response protocol across all buildings. Real estate investment trusts (REITs) - 330+ of the sites are owned and operated by Extra Space. During this 10 + year partnership, we have worked to maintain a level of organizational efficiency that is often difficult when handling multiple sites. Kings III is proud of our ability to streamline our services across entire portfolios. Our Client Relations and Service teams communicate regularly with one another and with the customer to set expectations, allow for an understanding of the company’s organization and create a personalized uniformity of experience across the board when it comes to how to implement and host our technologies. An example of this increased streamlining process includes us providing Extra Space Storage with regular “Tied-Into Reports”, identifying which specific phone lines are being utilized for emergency communications purposes across all sites. Extra Space Storage was thinking long term and saw the importance of getting a head start against the pending sunset of landlines. They recognized the additional benefits that would come naturally alongside this endeavor and in early 2017 started working with us to tackle the project. Of course, we all know there is more than one way to “go wireless”. Extra Space sought our expert advice to determine what method would make the most sense for their desired objectives and purposes. What would provide the same reliability as the landline while withstanding the test of time? Network Security: VoIP requires certain ports open to enable two-way communication, creating a security vulnerability. Customer networks are not generally Emergency Critical class, so outages are more likely vs. using public switched telephone network (PSTN). VoIP requires bandwidth guarantee for voice throughput. There were no Service Level Agreements for Extra Space Storage’s local networks. Using VoIP would transfer additional network maintenance to Extra Space Storage. It increases difficulty and involvement of client IT resources to troubleshoot emergency phones. In addition to the above, with 15,000 current customers already utilizing our cellular solution, we could vouch for the success and efficacy of using cellular. Why cellular? When customized for emergency use, cellular is the most viable solution to eliminate landlines. Cellular allows for 24/7 monitoring without giving a third-party access to the network and having to rely on Internet connectivity for service (an imperative in emergency situations). Extra Space decided to move forward with this proposal, and Kings III began to work with the company’s procurement and energy / utilities management team to build out an upgrade schedule. We broke the project into phases, starting with all REIT sites. This included all proper testing to ensure reliable service and a successful, repeatable upgrade path. We have recently completed this process with all REIT sites and have begun the line switching project on Joint Venture and 3rd party management locations. With the completion of REIT sites alone, we estimate that Extra Space will see around $100,000+ annual savings through the elimination of landlines. Most importantly, Extra Space will be able to realize their goal of eliminating all POTS lines with no service interruption or interference with other internal technology systems they have set in place. This may have not been so seamless had we not worked together diligently and thoroughly during the planning and implementation process to organize a phased rollout that would make sense and to carefully test each location to ensure the new system’s functionality. We are impressed with Extra Space Storage’s foresight and are grateful to have worked with them to pioneer a viable solution that addresses the future of telecommunications and allows for more efficiency and cost savings on a large scale. We look forward to seeing the project through to its final results and are excited to help them further solidify their leadership within the self-storage industry. For more information on our emergency help phone solutions, visit www.kingsiii.com.